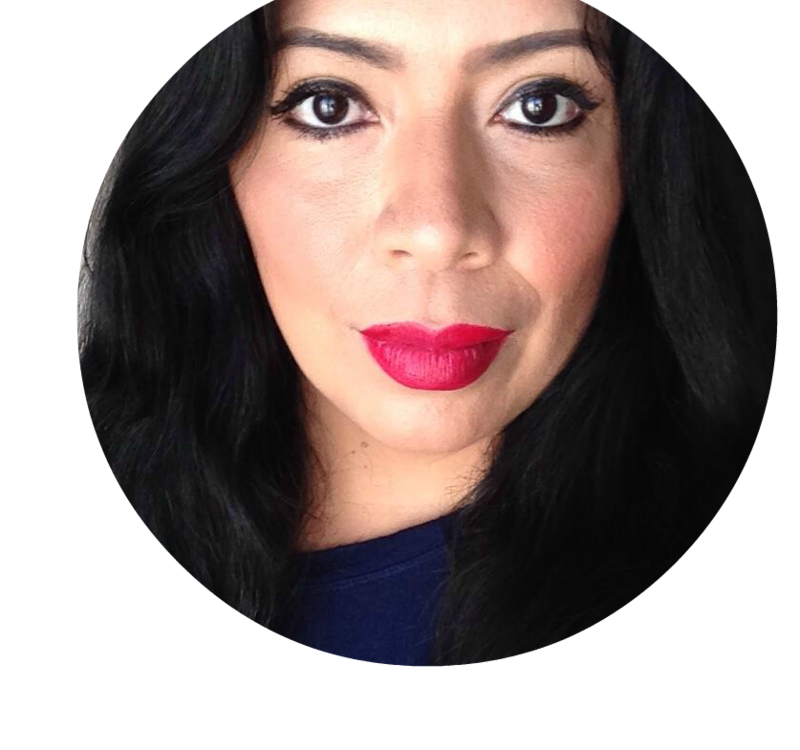 As an on-the-go mom my days are pretty busy, as I am sure is the same with many of you. My days start at 6:00 AM on most days, with some earlier mornings, and will end around 10:00 PM, and that's just the running around. At that time I still have to plan the next day, answer emails and take care of the cats and dogs before finally getting to bed. A mom's life is a busy one, and today I am going to share a secret weapon that helps me fight the tired, aching feet and lower back pain of another long day. Morning drop off: I drop off 4 of the kids at the elementary school, we only live two blocks away from the school, but because we live on the same street as the school, each morning is utter chaos and takes at least 30 minutes. I then drop of one of my oldest at college and head back for Julius who attends the same school for TK, but at a second campus. After getting everyone to school, I have three hours to clean my apartment, take care of household things like paying bills. Each morning I also clean up after the cats, currently 9 of them, and get some work done. To-do-list's are the only way that I don't lose my mind and the only way I don't miss paying an important bill or other household task. A few morning a week I also have to run errands or go grocery shopping. It's either run for a gallon of milk or a bag of cat food, but something is always missing at home. The good thing is that I have my phone to stay on top of work emails. By the time noon rolls around, I am picking my oldest up from college as well as the little guy, and I get a few more hours to work before it's time to pick up the older kids. We grab a quick lunch at home before heading out to after school activities and a little downtime for the kids. This is another great opportunity to catch up on editing photos or other works tasks. As a work-from-home mom, my laptop is always in my bag and the days consists of me working in bits and pieces. Of course there are always evening plans with such a large family. Recently, we've had two birthdays, a camping trip that required several trips to the store and we're always running to the mall for something or other. It really doesn't end, each day is packed to the brim. As you can see, my days are very long and it's not unusual for me to get home in the evening just two hours before bedtime. Days like those can give anyone serious lower back aches as well as aching feet and this is where Dr. Scholl’s® Custom Fit® Orthotics help me keep going. Have you ever been in the mall late one evening, still looking for that one pair of shoes for the kid who keeps outgrowing them and wondered how you would be walking out because your feet and lower back were ready to give up on you? Right here! This happened to me all the time, not only am I carrying to many extra pounds but I tend to forget about my posture and by the time evening hits I was in so much pain. Did you know that pain in your lower back and knees can originate from your feet? With Custom Fit® Orthotics, get the custom support and cushioning you need to disperse your foot pressure and reduce the pain-inducing stress on your knees or lower back. You can find the Custom Fit® kiosk at select Walmart stores and get started to a much more comfortable day. Find a Custom Fit® Kiosk near you and get the recommended insert for you in under 2 minutes. Which Custom Fit® Orthotic Insert do I buy? 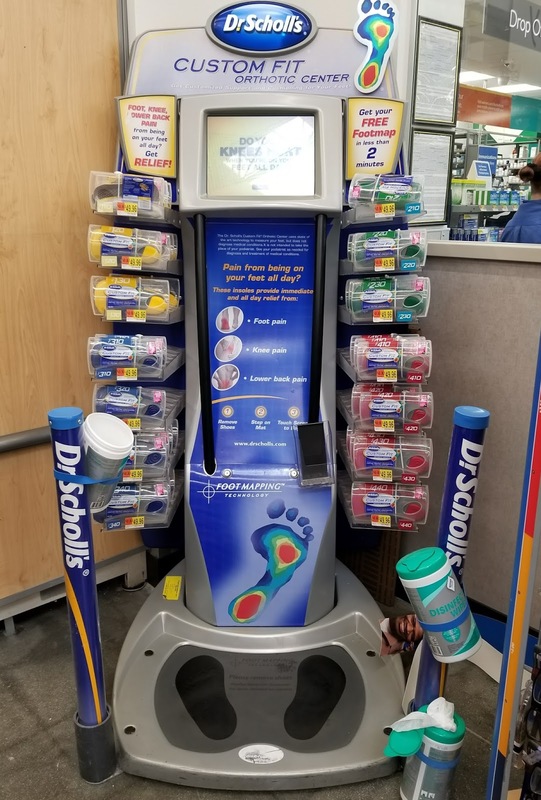 Dr. Scholl’s® experts in biomechanics developed the advanced FootMapping® technology used in the Custom Fit® kiosk. It uses over 2,000 pressure sensors to create your Custom Footmap – identifying your arch type, foot length and unique pressure points. 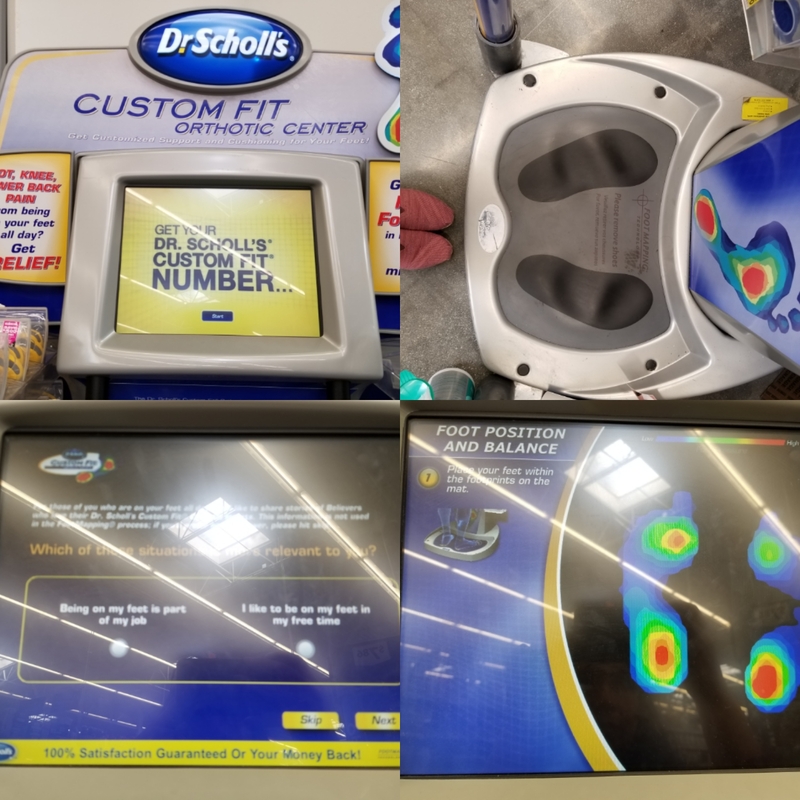 In under 2 minutes, the kiosk evaluates all this data and recommends the Custom Fit® Orthotic Inserts that are right for you! Simply follow the prompts at the kiosk - starting with standing at the foot mapping pad and following the prompts. You give the kiosk a little bit of info about your day and how long you're on your feet, stand on one leg and then the other, and the machine will map it all out for you. 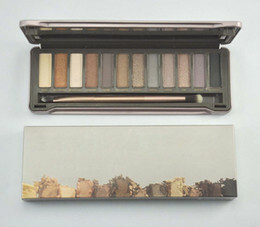 No guesswork needed. 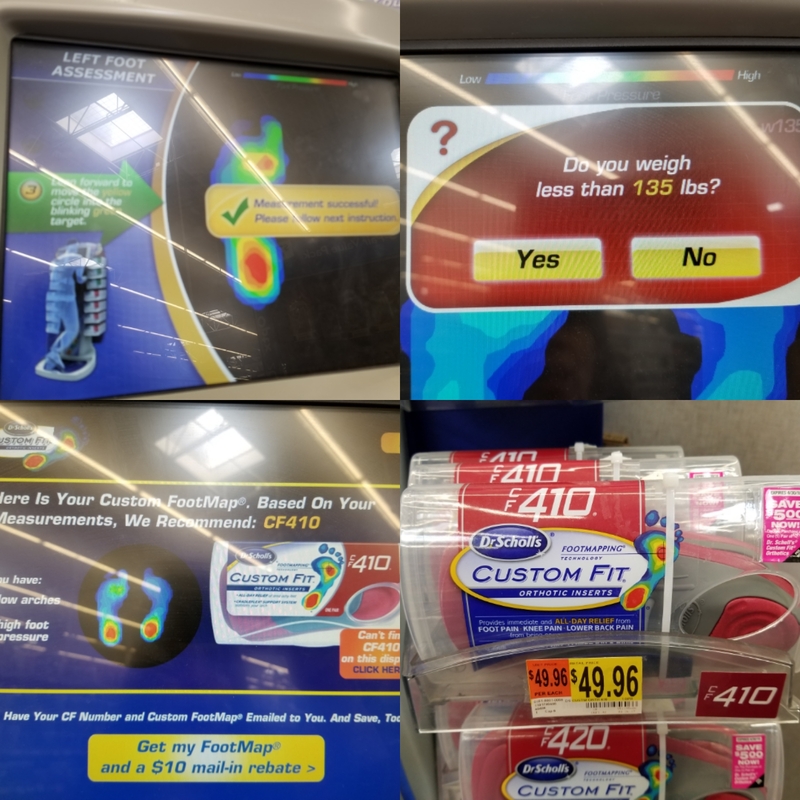 In just two minutes, the FootMapping® technology gave me the exact number of the insert that will be targeting my particular needs. 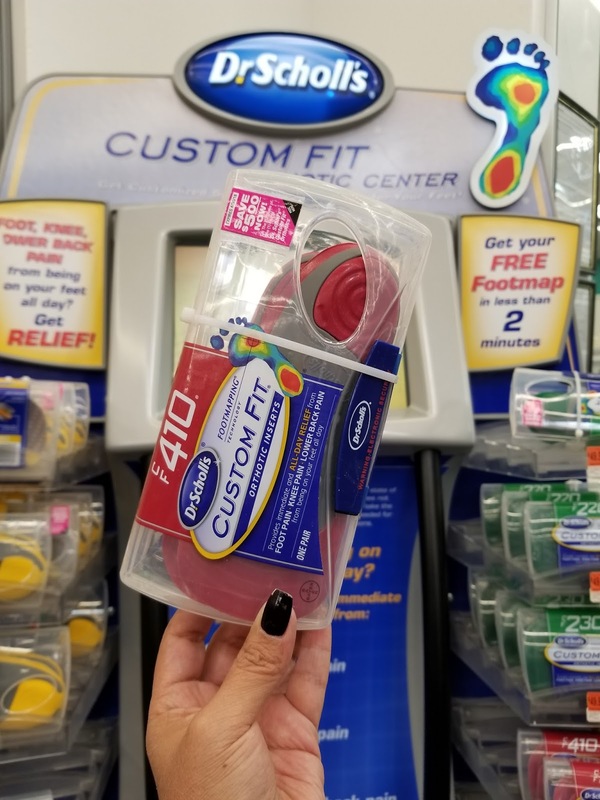 The Custom Fit® Orthotic Inserts are conveniently located on the kiosk, which makes finding your number easy. Right now you can get a $10 savings after purchase on the Custom Fit® Online Rebate Center. Dr. Scholl’s® Custom Fit® Orthotics are to use in your everyday life and can be used with most shoe styles. I usually wear my most comfortable pair of shoes all week but will move the inserts if I happen to change it up. I love that Dr. Scholl’s® Custom Fit® Orthotics don't tie me down to one pair of shoes. Custom Fit® Orthotics are made up of 4 layers, each providing a different benefit. Together, these layers provide support and cushioning that are custom fitted to your feet, to immediately relieve foot and lower body pain and provide you with all-day comfort. Place each on in the corresponding shoe and you are ready to go. With the inserts, my shoes feel like a totally different shoe. Even though I tend to pick comfortable shoes for the most part, the Custom Fit® Orthotics take them to a whole different level. I don't think we realize how much of our day is spent on our feet, even for someone like me who works at a computer and is in the car most of the day. But with a house that has stairs and so much running around, I am on my feet a lot. Now, I can get through long days without lower body pain, because Dr. Scholl’s® Custom Fit® Orthotics are an effective solution for foot, knee and lower back pain. Sweet relief has never felt so good!